Can I get additional Email Addresses? Yes, with our access plans, multiple email accounts are included. To sign up for another email address, simply email support@s1i.net with the username and password that you would like. Please also include your account billing name. Accounts with hosting include a management interface to add, edit and delete email accounts. Please check under Domain Email for more help. How do I send pictures or files with my e-mail message? The following instructions assume you already created an e-mail message. With your newly created message, click the "Attach" icon (usually a paperclip). If you cannot locate the "Attach" icon, choose the "Insert" menu above, then click "File". Now you must locate the file you wish to send. Double-click the file once you have located it. Your file or document will then be included in your e-mail once it is sent. You will notice that the e-mail message now contains a new icon. This icon represents the type of file attached to your e-mail. Clicking "Send", will send your message along with it's attachment(s). How does an e-mail address work? E-mail seems to be quite the complex animal, however it is the contrary. In order to begin to understand how e-mail works, you must first understand how to read an e-mail address. user: This is the recipient's user name. Most user names are a single word representing the person's first or last name, or a combination of the two names. @: This symbol (it's pronounced "at") separates the "who" part of the address (the part to the left of the @ sign) and the "where" part (the part to the right of the @ sign). provider: This is the Internet name (that is, the domain name) of the user's access provider. It tells you where the user's mailbox is located. com: The last part tells you what type of organization you're dealing with. Common suffixes are .com (commercial), .org (not for profit organization), .gov (government), and .net (network). Attachments can be a mixed bag of surprises. Ordinarily an attachment is simply a file of some sort that somebody wished to share with you. However, under adverse circumstances, an attachment can carry with it a harmful virus that can potentially damage certain files on your computer, if not your computer itself, in the worst cases. It is important to identify the attachments that you're going to open before doing so. Each e-mail client will show attachments differently so, depending on the client you've chosen, you will need to access the attached files in different ways. Most commonly, you'll see either a new paperclip icon in the message itself, or you will simply see a list of the attachments under an "Attachments" header somewhere in the message. If you can't identify the sender of the attachment or if it appears to be something that has been mass-circulated, it is suggested that you "Right-click" on the attachment and move down to "Save as", save the file locally on your computer and then scan the files with your virus scan program before opening. By following this advice, you minimize the chances of your data or computer being damaged by an illicit computer virus. Depending on the format of the attachment, you may or may not be able to view it. Simply put, if you do not have the software that was originally used by the author of the file, you will not likely be able to view the file. In cases where you do not have the associated software, you must obtain it before you will be able to view the software. As with most rules in life, there are exceptions to this rule, but we will not venture there. For more information regarding file-types, please contact your computer vendor. How do I configure my Iphone for SourceOne E-mail? 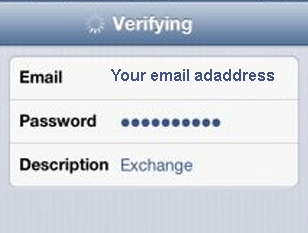 Complete the Name, Address(email address), Password and Description fields. If you have your domain email with SourceOne, the your mail server would be mail.yourname.com. How do I configure my Android Device for SourceOne E-Mail? 1. On your Iphone's home screen, tap Settings. 2. Tap Main, Contacts, Calendars, then tap Add Account. 5. For Server, enter: mail.s1i.net. For Description: enter a "friendly name" to identify the account. 6> you may receive the following error message. Simple tap Continue if it appears. 7. Made sure Mail, Contacts, Calendars, and Reminders are set to On. You'll be prompted with the option to keep your existing Iphone contacts intact, or have them replaced with those on the server. Keeping your local contacts may result in duplication, so only keep your Iphone contacts if you have unique entrees on your Iphone. 8. Slick Save when complete. Your iphone will take several minutes to fully synchronize your email. How do I log into the control panel for my domain? Our hosting includes many features that are accessible in your domain's control panel. Depending on your hosing account, a coupld options are available. For more help or information please fill out a support form here, or visit SourceOne Hosting, or contact us. Voip is an acronym for Voice Over Internet Protocol, which by itself means voice over the Internet. It's a technology that delivers voice communications and multimedia seasons such as video over Internet Protocol (IP) networks. VoIP solutions allow a interaction between users on any two users on the Internet when a user wishes to place a call. To place calls via VoIP, a user will need a software based sip phone program OR a hardware based VoIP phone. Phone calls can be made to anywhere and to anyone: Both to VoIP numbers as well as old cooper line phone numbers. Businesses that choose to use VoIP systems instead of traditional copper-wire telephone systems experience many benefits such as reducing their monthly phone costs, increased mobility and productivity among others. With the Voicemail to email feature, your voicemail messages are delivered to multiple email addresses. Simple press play on the email and hear your message as left by the caller. Our server converts and saves the voicemail as a .wav audio file and then sends it to your email account. A VoIP telephone, also known as a SIP phone or a Softphone, uses Voice Over IP (VoIP) to place and transmit telephone calls over an IP network, such as the internet. VoIP converts the standard telephone audio into a digital format which can be transmitted over the internet and also converts incoming digital phone signals coming from the internet to standard telephone audio. A VoIP telephone allows users to make phone calls using VoIP, to any softphone, mobile or land line. A VoIP telephone can be a simple software-based softphone or a hardware device that looks like a common telephone. You need a high speed internet connection and a VoIP phone. A VoIP phone can be an IP phone, which is a phone designed to work with VoIP. Or a VoIP phone can be a standard telephone, with an ATA phone adapter. Or you can use a softphone, which is a computer program that allows you to make VoIP calls from your computer. No. You can just use the phone via the ATA adapter or use your softphone on your computer or mobile phone. You do need a computer if you are going to be using a softphone. There are several advantages to VoIP over a traditional phone service, such as, price, portability, and extra features. A person can pick a number, rather than be locked into certain area codes and prefixes. The phone line or number also goes with you. If you move, you still keep the same number!